By Frank Bryan Ltd., London & Worcester. Size 3 (71/8- 73/8). 1941 dated. The overall appearance is good. The leather is quite clean, fairly supple and has decent original chromed finish. There are minor marks but no serious issues. Fitted with zipped earpieces in good overall condition. These have some surface scuffing/rubbing - notably the left which also has a small nick (no leather missing). Both earpieces have working original zips, one complete with leather pull tag. Rubber receiver carriers are fitted within. The chinstrap still has the metal end piece and the Bennett buckle retains the leather covering. The backstrap and rear Bennett buckle are also good. The chamois lining is reasonably clean with less than average soiling. Both inner donuts have been carefully removed but this is not visible when displayed. There are also a few small holes in the lining near the forehead. With 1941 dated maker's label and indistinctly marked original airman's name. This example has been modified for use with an E-series oxygen mask by the addition of press stud fasteners and 'flat hook' oxygen mask clip making this a relatively rare variant. Unwired. Wiring, receivers, microphones and jackplugs can be supplied at extra cost if required. 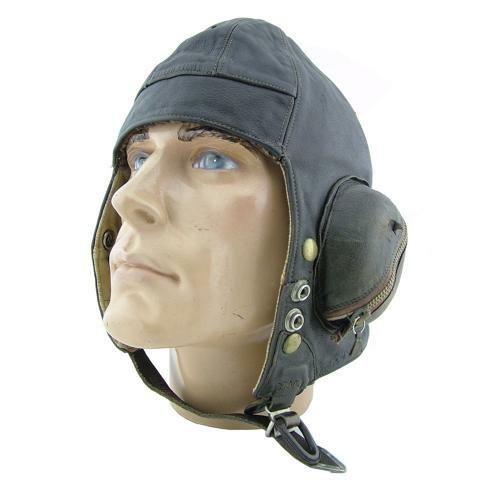 We have added a set of good RCAF rubber cushions inside the earpieces to improve the appearance. A good '+' used example. Stock code H18072.